Her whole world has been flipped upside down. She’s lost…and only he can find her. Lori Black had everything she could ever want—security in social standing by being one of the most popular girls in school, a hot boyfriend, and a set path toward her future. But her brother’s overdose flipped her world upside down and now nothing makes sense. After spending a year away from home, Lori is ready to try to reclaim her old life. But a lot can happen in a year, and when Lori returns, she realizes she isn’t the superficial girl she left behind and maybe she doesn’t fit the space she used to. Rejected by her old friends and struggling to deal at home, Lori is lost. And the only person capable of understanding her is the quiet boy, Archer, whom no one knows anything about. It is Archer who brings Lori the possibility of being found. Reader Advisory: This book contains some brief scenes of violence and attempted sexual assault. 5 for the beginning. 2 for the ending. Lillie Todd is a new-to-me author, and I found the writing style easy to fall into, to relate to the characters, and become hooked into the story. Lori Black's twin brother committed suicide via overdose, leaving Lori to pick up the pieces. After a year with her grandmother, she returns back to the very school she used to reign supreme, but Lori is a different girl than the one who left. Nothing has changed at school, the same vapid students, except for the new guy. Archer. Lori was a great character, strong, firm in her beliefs, loving and compassionate. I enjoyed the slow evolution between Lori and Archer, how it didn't devolve into insta-crush/lust/love. The connection between the pair felt very real. I was hooked, clicking the pages nonstop for the first 50%, but after that it kind of went downhill for me. The last half of the book felt out of place, not with the flow of the first half. Threads came into play that didn't mesh with the overall feel of the novel and information was purposefully withheld as a mystery (Archer's background) and it didn't feel like a mystery, just forgotten until it was added to the story at the very end. In a novel that was so firmly set in reality, the entire thread with Cam was too hard to swallow. He was everywhere Lori was, which was a statistical impossibility, as the man did have a life and a minor girlfriend and a job, and couldn't stalk Lori 24/7. There was never a reason Lori didn't call the police, and with Archer's background, it made no sense why he never did either. Then there is Lori's frenemy, where we never saw a resolution of any kind. Also, with Lori being a minor, Cam a legal adult, and the accusations leveled, (with witnesses and evidence – Kit and a bloody knife wound, a knife with Lori's blood and Cam's fingerprints, breaking and entering with trespassing, why would an animal attack a person, a history of harassment and sexual harassment, including the bruises still on her arms, and the fact that it occurred in the minor's residence where a struggle took place. All that combined was enough for a major conviction. I don't even know if Lori was allowed to invite an adult into her parents’ home, as it wasn't hers) there never would have been a he said-she said (saying there was no crime because it couldn't be proven), especially with the events surrounding Kit. As a minor, Lori's parents would have been contacted before her boss and the police could remove Kit from the premises. In fact, they were at home. At that point in the novel, I wanted to play editor and rein the author in. Then Archer's story came near the ending, and I'll use the term Jumped the Shark. After that, I didn't find the book to be an enjoyable read because it was without research with laws, human nature reaction, and felt out of shock-value. Absolutely implausible. The conflict between Lori and Archer didn't make a lick of sense either, especially the road trip. I felt the last half was a different book entirely from the one I was reading in the first half. Regardless of my feelings toward plot points, I do feel it was a good book, one both young adults and those young at heart will enjoy. I look forward to reading more by this author in the future. Young adult age-range: 14+. Physical violence and fade-to-black sexual situations. I have been a storyteller for as long as I have been a reader. There is no greater pleasure in life than diving headfirst into a new world, meeting new characters and falling in love over and over again. There is a certain kind of magic in books, and I hope to weave a spell over my readers. I grew up in the countryside of Southwest Scotland and it was amongst the rugged and sprawling landscape that my imagination was set loose. When I’m not spending time with my favourite characters of my own creation, I can be found running around like a headless chicken trying to catch up on everything I have ignored since disappearing in my head. 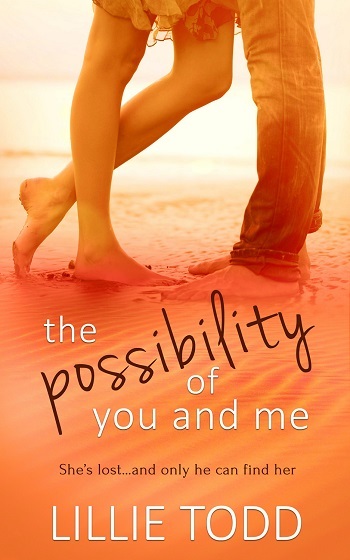 Reviewers on the Wicked Reads Review Team were provided a free copy of The Possibility of You and Me by Lillie Todd to read and review.